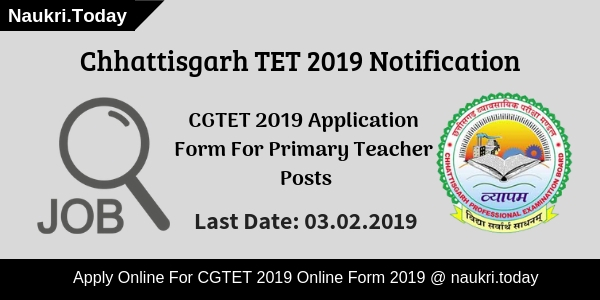 CG TET 2019 Notification is released by the Chhattisgarh Professional Examination Board for filling up Primary Teacher Vacancies. Candidates those who are interested in Teacher Jobs may fill up CG TET Online Form 2019 from here. The Registration process is going to begun form 17.01.2019. Applicants must submit their CG TET 2019 Application Form before the last date i.e 03.02.2019. The Department will conduct the Chhattisgarh Teacher Eligibility Test on 24.02.2019 at 27 different cities. 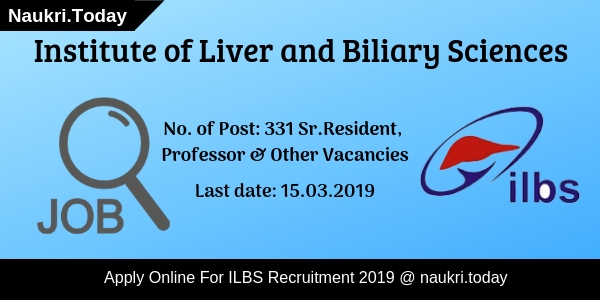 For more information aspirants should read below article carefully. What Are The Important Dates To Remember For CG TET 2019 Application Form? Fresh Update as on 12.02.2019: Hello Friends, CG TET Exam date has been postpond from 24.02.2019 to 10.03.2019. Now candidates needs to appear for examination on 10.03.2019 at their respective exam centers. For more updates relevant to exam participants stay connected with us. Closing Date To Apply Online for CG TET 2019: 03.02.2019 11:59 P.M. The timing of Exam (01st Shift): 09:30 a.m. to 12:15 p.m. The timing of Exam (02nd Shift): 02:00 a.m. to 04:45 p.m. Applicants who are interested in Teaching Jobs must apply for CG TET 2019. Before applying candidates may check here eligibility criteria, age and much more for Chhattisgarh Teacher Eligibility Test 2019. Here we provided you links for filling up CG TET 2019 Application Form. Participants must be 12th Pass with D.El.Ed/B.El.Ed and Degree with D.El.Ed is eligible for Lower Primary Teacher Posts. 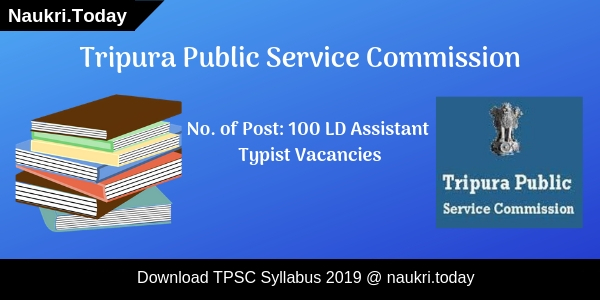 Candidates who are interested in Upper Teacher Vacancies should require Degree with D.El.Ed/B.El.Ed and 12th Pass with B.EI.ED for CG TET 2019 Application 2019. A 12th Pass Certificate or Degree both must be registered form recognized university or Institution of Government. 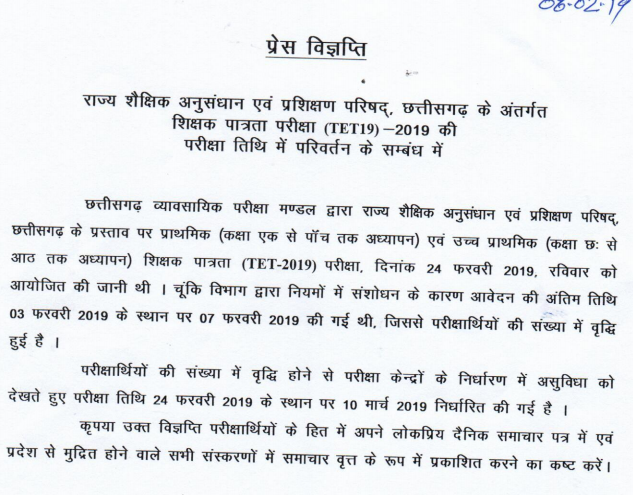 For furthermore details candidates may download CG TET 2019 Notification PDF form links given here. The Minimum Age of applying candidates should be 18 years and not more than 21 years for CGPEB 2019 Application Form. For Upper age relaxation information candidates may refer to the official CG TET 2019 Notification. Participants may download CG TET Application Form either from here or from the official website of Chhattisgarh Vyapam PEB. Contender should use their Credit Card, Debit Card and Internet Banking for the payment of an application fee for CGTET 2019 Online Form. Candidates should check here Category Wise application fee for CGTET Application Form 2019. Candidates who belong to General Category need to pay Rs. 350/- for one paper and for two papers they need to pay only Rs. 600/- . OBS Category Aspirants have to pay Rs. 250/- for one paper and Rs. 400/- for two papers for an examination fee. SC/ST/PH candidates will pay Rs. 200 for one paper and Rs. 300 for two papers for CG TET 2019 Online Form. Selection of applicants will take place on the basis of written examination, Interview and Document Verification for CG TET 2019. A written examination will be held in two phases. According to the official CGTET Notification 2019, an examination will be held on 24.02.2019 tentatively. Candidates who qualify in written test will take part in an interview and Document Verification. The Chhattisgarh Teacher Eligibility Examination will be held at various centers. The Department has issued a list of exam center for CGTET 2019. There are 27 cities are given below along with Number of Center present at that particular area. Candidates should log on to the official website of Chhattisgarh Vyapam that is cgvyapam.choice.gov.in. Click on The CGTET 2019 Notification PDF given at the Homepage. Then open CG TET 2019 Detailed Advt. Read complete Notification carefully and check eligibility criteria. Eligible candidates may click on Online Application Form option. Fill Up CG TET Application form 2019 carefully. After that submit an application fee through a suitable source. Candidates must recheck your application form. Conclusion: Chhattisgarh Professional Education board has issued notification for CG TET 2019 Examination. Candidates who are interested in teacher Jobs may apply online from here. For furthermore information applicants should read the above article carefully.